Standing in a multi-purpose room at Peralta Elementary School, North Oakland resident Rachel Kahn-Hut peered intently at a diagram showing renderings of a house, a person’s silhouette, and a commercial building. She squinted, then stood back, then looked at the diagram up-close again. One drawing showed the the commercial building at 30 feet high, then at 45, then 60 feet high. She thoughtfully considered different possible height limits for the large commercial building, and how they might affect her neighborhood on 66th Street, just off Telegraph Avenue. Several dozen other Oaklanders milled about the room, as well, taking in similar diagrams and outlines of possible changes to the city’s residential and commercial/corridor zoning codes. The Saturday morning community meeting at Peralta was a chance for Oakland’s Community and Economic Development Agency (CEDA) to unveil to local residents the first proposals for rezoning some key city residential districts and commercial/corridor areas like Telegraph, College Avenue, and MacArthur and International boulevards. Zoning codes determine things like how high a neighbor can build their house, whether a neighbor can build multiple units, how tall commercial buildings abutting residential neighborhoods can be, and how many auto repair shops, dry cleaners, or other specific businesses a neighborhood can have. A city’s General Plan provides overall growth and development guidelines, but doesn’t specify details or parcel-by-parcel rules. Zoning codes take care of those. 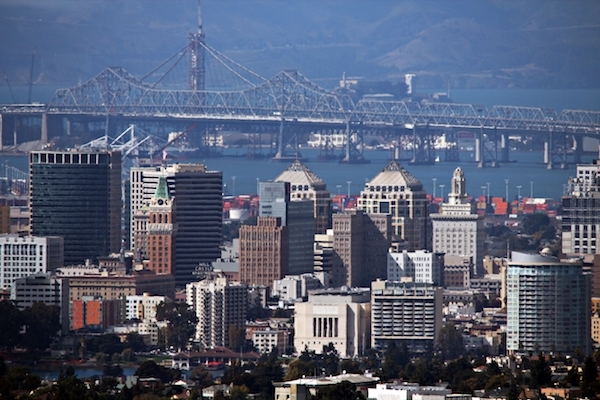 Oakland’s General Plan was updated in 1998, but its zoning code dates back to 1965. This decades-long break between the conceptualization of two sets of guidelines that are supposed to complement one another has created some confusion for more than a decade, multiple city staffers said, explaining that an interim document has been used to bridge the gap. Open space, industrial, and downtown zoning codes have all been updated over the past couple years. Now residential and commercial/corridor areas are due for their makeover. At Saturday’s meeting, CEDA planners Neil Gray and Alisa Shen presented some general information about possible new regulations. According to Shen, new zoning will bring bigger changes to commercial/corridor areas than residential areas. Gray ran down some of the changes people living near those commerce areas can expect: more restrictions on auto repair shops, for example, and a ban on ground-floor residential units in many new construction projects. The meeting then took what CEDA officials called an “open house” format, with different posters and diagrams outlining possible changes stationed around the room, and staffers on hand to informally answer specific, individual questions at each station. Meeting attendees examine diagrams and charts outlining possible updates to Oakland's residential and commercial corridor zoning codes. The announcement of this setup frustrated many attendees, who wanted more group dialogue and public input through a formal question-and-answer period to address questions and concerns about the process and possible changes. As Shen explained the open house structure, objections chorused from the seated crowd. “This is not a public process!” shouted someone from the back. “It’s not democratic – with a small ‘d,’” called a man who was standing in the aisle. “Are you trying to educate us, or turn us off?” a woman asked loudly, prompting a brief moment of silence, then an “ohhhhhhh” from the crowd, which turned to look at Shen. Eventually Shen and Angstadt were able to restore order and get people to follow the open house format. As attendees circulated the room studying the different exhibits, there was primarily a mixture of curiosity, confusion, and consternation as people tried to decipher what new guidelines could mean for them. Eventually specifics will begin to crystallize further, as more public meetings take place, and the zoning code updates go through drafts and changes after more public input and behind-the-scenes tweaking, city officials said at the meeting. For people who missed the Peralta gathering but want to participate in the process or get more specific information, an identical community meeting is scheduled for 6 p.m. this Thursday, November 12, at the Fruitvale-San Antonio Senior Center, located at 3301 E. 12th Street. Also, for more information on how possible zoning changes may effect a resident’s specific situation, Angstadt said details of the preliminary new zoning code drafts should be available here within the next few days. A meeting-goer checks out an Oakland General Plan and zoning map. Meeting attendees examine diagrams and charts outlining possible updates to Oakland’s residential and commercial corridor zoning codes.